I mention a large number of people on this blog. Some get lots of mentions, some appear only once or twice but there is one name that will you may have noticed cropping up time and again and that name is Tess. So I figured she should probably have her own page, partially to clarify for those who wonder who the hell I keep going on about and partially because, well frankly, she deserves it. Tess is my pet dog. She was born in August 2011 and became my dog in October 2012. At first, she was a bit of a nightmare but then began to calm down a bit. 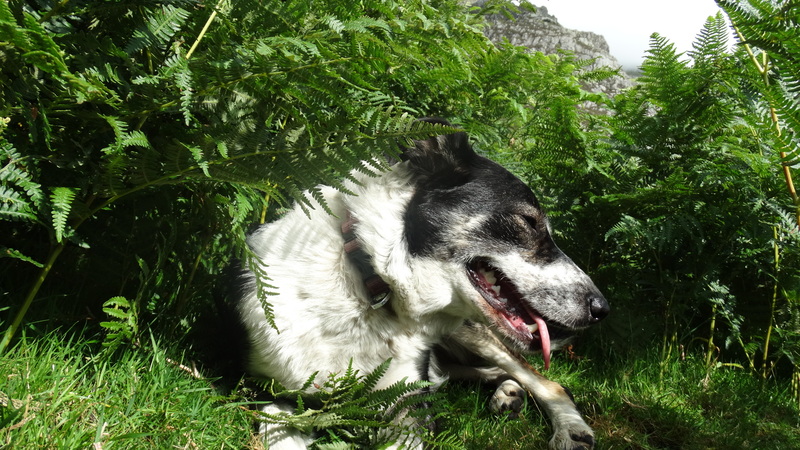 We went for walks around Llanberis and Capel Curig then started to head out a bit further. One evening we went out for a walk… up Snowdon, and made it to Halfway House and then longer wanders in the hills racked up. Her first graded scramble was up the North Ridge of Tryfan, in full winter conditions. She did incredibly well on the way up, roped up to me although that didn’t mean we made it to the summit with enough time to head down so we ended up heading down Y Gully on the West face of the mountain. She did remarkably well, considering the eight abseils we ended up doing and the sub-zero temperatures. Her first bouldering day was at Sheep Pen in the Nant Ffrancon. 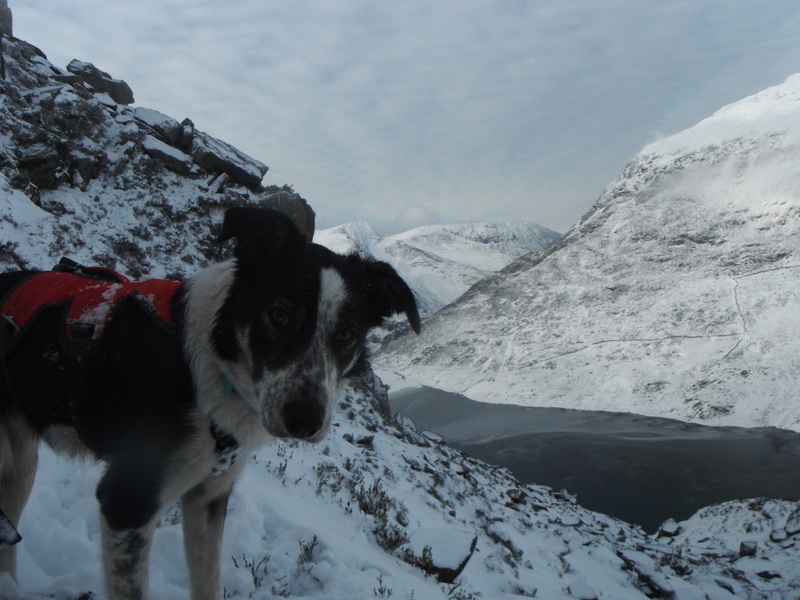 She was absolutely brilliant from the off, and makes a great crag dog – wandering around the boulders and trained not to step on the pads. 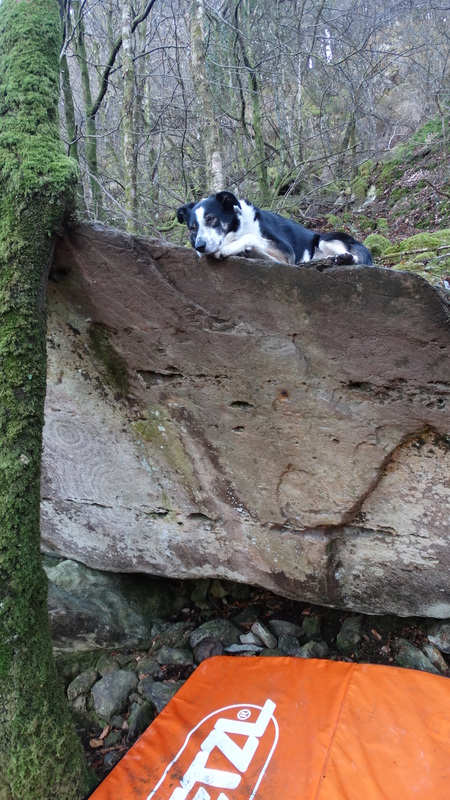 She’s visited most of the North Wales bouldering venues by now and continues to help me find some more. As if that wasn’t enough, she may possibly be more travelled than you! Not only has she been to Dartmoor, the Peak, Yorkshire and other British venues, her first camping experience was actually in Belgium and she’s wandered around boulders in Germany, Austria, Switzerland and of course, has been to Font, not to mention her exploits around Scandinavia and many other venues. Sadly, it’s not very easy for her to fly, so places like Spain are a touch too far but i have no doubt she will continue to find, chase and eat sticks all over mainland Europe and the UK for many years to come.